Large stacked hair bows Size: 4.5 inch - 5 inch, handmade from grosgrain ribbon, Attached with patially covered metal alligator hair clips, which won't hurt babies' hair and scalp. 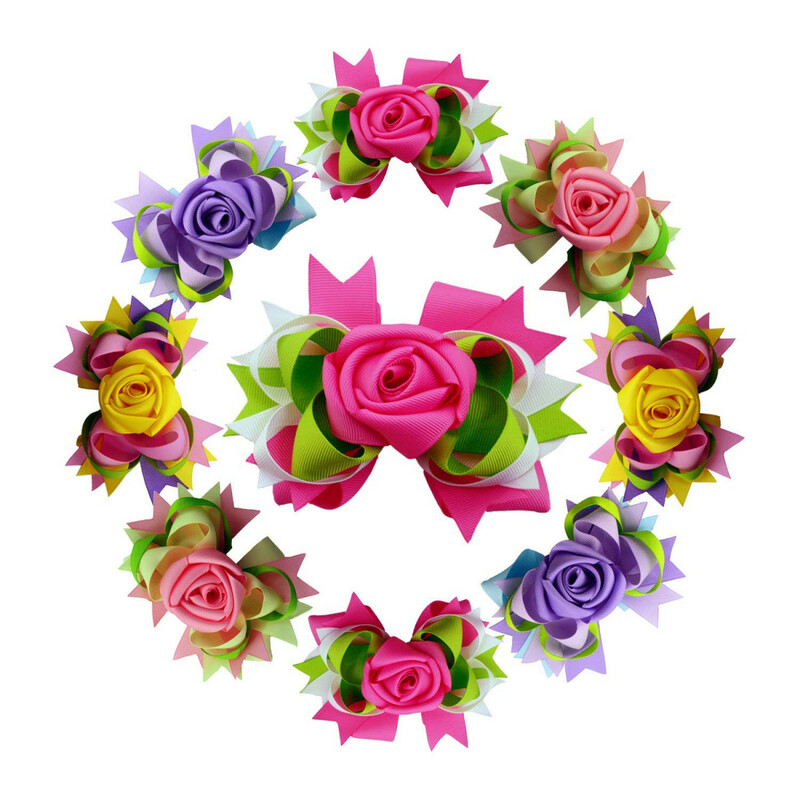 Pack of 4 pairs fancy spike layered rose flower hairbows, Each girls bow is made from at least 3 colors ribbon. 4 main colors rose flower: pink, rose, purple, yellow. These teenager girls flower clip are wonderful photography prop for photographers, kids photo shoot; Dress up baby girls for her first photo shoot - these baby hair clips will give her a truly adorable look! Toddlers and teens can wear them to birthday parties, pageants, Easter parades, Christmas events, or just to accessorize their casual everyday outfits. These large toddler hair bows are perfect for baby girls, little girls, toddlers, teens, kids, children, juniors, women, etc. Girls flower hair accessories match your any outfit, headband, hat and T-shirts. They are perfect for crafts, decoration and girls hair. 100% SATISFACTION SERVICE: If you are unhappy with your purchase, please do not hesitate to contact us. We will do our best to solve the problem straighway. which gives your girls a full protection either for their gentle skin or fine hair. sealed, so it won't fray or have loose threads. As each flower bows is attached with sturdy single-prong alligator clip, they are easy to be put on and taken off. 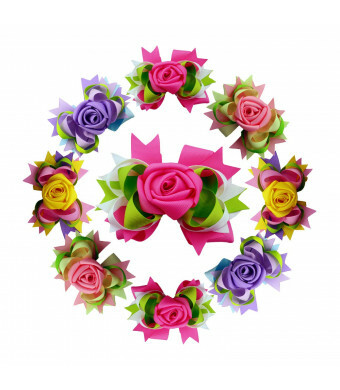 Our experienced workers handcraft these big layered flower bows in perfect shape. Each girls bow is made from at least 3 colors ribbon. 4 main colors rose flower: pink, rose, purple, yellow. The secure & premium packaging prevents dust and keeps bows intact when customers receive at hand.